Bluehost Review: We Did Every Test Possible, And Here are the Results! Bluehost is one of the best technologies out there in terms of its features, fast servers, and solid security for your websites and blogs. It’s been around for twenty years and specializes in shared hosting. It has kept its quality consistent throughout the years. With time it has now started offering additional types of hosting services like VPS, WordPress, and dedicated servers. By doing a Bluehost Review, We want to help users determine if Bluehost will fulfill their hosting needs. Bluehost is a good option for anyone looking for web hosting. Bluehost is one of the best WordPress Hosting providers. Especially considering the fact that Bluehost is an officially recommended hosting provider by WordPress. Considered one of the biggest hosting companies in the world, there is no blogger or marketer that hasn’t heard of Bluehost. There are many reviews of this company online, some good, some bad. It can be confusing as a beginner to discern whether Bluehost is the best choice for you. This is why we have taken our time to provide this review so that you can make an informed decision. Before we begin, let’s look at the background of this hosting company. Bluehost Review; Is it Right for Your site? One of the oldest hosting companies, Bluehost was started in the year 2003 by Matt Heaton. He saw a gap in the hosting market and sort out to take advantage of it. At the time hosting facilities offered little space and weren’t as user-friendly. The company has now steadily grown to become one of the biggest hosting companies in the world. This shouldn’t surprise you as they host over 2 million websites on their servers. They partnered with WordPress in the year 2006. With WordPress naming them as one of their recommended hosting solutions. 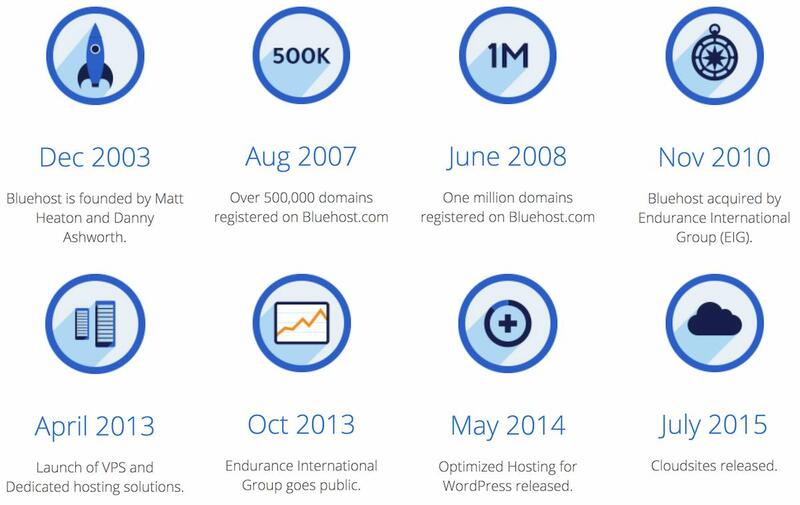 Bluehost would later be acquired by Endurance International Group in the year 2010. Bluehost boasts of an impressive hosting infrastructure and support system. This hosting company has played a great role in the growth of WordPress as they have strongly supported the open source software. On top of that, their cheap first time hosting plans has also helped attract many users to the platform. You need the hosting company that you use to keep your site online without any hiccups ( the site going offline). The hosting company shouldn’t need too much normally to host your site. Many of you are generally on a tight budget. Nothing is good all the time. There comes a time that something will go wrong. You want to make sure that your hosting company has a good support system in place in case any issues arise. Your website is your money maker, anytime it’s offline, you lose money. There are many performance metrics that you can look at, but the one that we shall be focusing on is speed. It’s not that other metrics are pointless, it’s just that speed is important. This is for two reasons; User experience and SEO. In today’s world of instant gratification, no one wants to wait too long for a website to load. In fact, the best website load time is pegged at 2 seconds. Speed is also a key factor in Google rankings. Long loading times could see your site get demoted to lower positions. This coupled with poor user experience could see your website taken down to oblivion, never to be seen again. There are many studies that have shown the correlation between site speed, rankings, and conversion rates. As far as performance is concerned, Bluehost does well. We tested the site speed by making a staging site, a dummy site with content and images. We placed the site on Bluehost and used Pingdom to view how long it would take the site to load. Lo and Behold! It loaded in quick time. We were impressed considering that no caching or optimization plugins were being used on the site. There was also a test done to see how the server would respond when there was increased traffic to the site. Needless to say, the servers from Bluehost performed well. This is good when compared to other budget hosting plans. Other hosting companies normally throttle websites once they get significant traffic. In some extreme cases, the sites get taken down for prolonged periods of time. Don’t worry this won’t be the case with Bluehost as long as your website isn’t resource heavy/hungry. It was impressive, the fact that no downtime was recorded as we did the tests. All this was done on the shared hosting plan. This is good as it’s likely that first-time beginners like you will start out with this plan. When looking at performance and in particular speed, we’re looking at how quick the server can load a web page with images and text. Using tools like Pingdom, we get an idea of how quick a server is. The problem with this is that the images and text can load slowly and thus give the wrong impression on speed. Images especially ones that aren’t optimized and are large in size can take much longer to load. The best way to ascertain the speed of a server is to look at the server response time. The server response time is the amount of time it takes a web server to respond to a request from a browser. There are tools that you can utilize to test this (we used Bitcatcha). Bitcatcha allows us to test the speed of the server without having to use a live website i.e. load data. 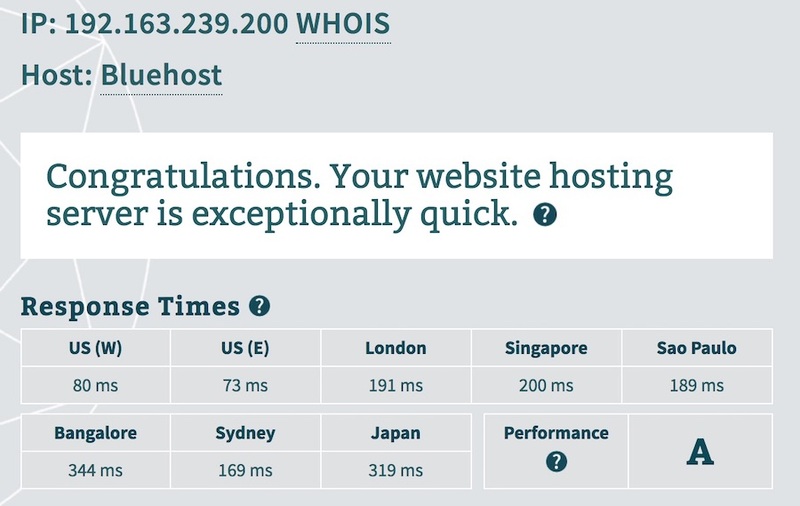 As per the results we obtained, Bluehost seemed to perform well in the U.S. The same can’t be said about other locations where the server had higher response times. If you’re an affiliate marketer/blogger targeting the U.S. market, then Bluehost works just fine. This is where Bluehost is said to be lacking most times. The hosting company offers three options for support; Knowledgebase, Live Chat, tickets and Phone calls. The Knowledge Base is the hub for beginners. If you’ve never used a host before, we’d advise you to go through it before using Bluehost. The company has included articles, step by step guides and instructional videos as part of the knowledge base. You can get most of the basic issues solved by making a quick search in this section. The ticket system works like with any other company. You send a ticket explaining your problem and you get a response at a later point in time. Live chat allows you to have a chat with a representative from Bluehost to help solve your queries quicker. It’s a great initiative from Bluehost, the only problem is the customer support is outsourced. Many of the companies that are owned by EIG normally outsource this part of the company to developing countries like India. This is normally not a problem. We’ve had most of our queries solved via live chat. With that said, you might at times encounter one or two customer reps that aren’t native speakers. This might make it more difficult to have your issue solved due to the communication barrier. The response time from customer support could use some improvements as well. You could get long waiting hours of up to 15 minutes, which isn’t good compared to other hosting companies. Overall, you can expect a good experience when using either of the options offered by Bluehost. This is the cheapest of all hosting plans. It’s great for beginners as you can start a new website at low costs. This plan is meant for websites with low amounts of traffic. In this plan, your website shares server space as well as resources with other websites. Also known as Virtual Private Server Hosting. This hosting plan is normally considered an upgrade to shared hosting. You get a virtual private server setup for your website. This allows you to get a degree of dedicated server resources as well as more access to your server. It’s important to note you’re still in a shared environment, so your site should not be heavy on resources. A pretty expensive plan and one that we’d not advise a beginner to start with unless they are building a web app or a site that will get a ton of traffic constantly. In this hosting plan, you get allocated a server for your own use. You get all the server resources dedicated to your site. With this plan, you’re expected to manage the server on your own, so technical expertise is required. As the name suggests, a cloud hosting plan utilizes the power of the cloud to host your site. Cloud hosting is considered a mix of VPS hosting and Dedicated hosting. It offers the reliability of dedicated hosting and the customization ability of VPS hosting. It’s considered a reliable upgrade to the shared hosting plan as the website is kept on the cloud using multiple servers. This means it can be switched to a different server when there is a hardware failure or a spike in traffic. This hosting plan is made tailored for WordPress websites. You get quite some few benefits from this plan like private server allocation and enhanced server optimization. You also get Sitelock security off the bat and expert support that is well versed on WordPress. Woocommerce is the most popular eCommerce plugin for WordPress. It’s what many people use to make their websites into online stores. Similar to WordPress hosting, this plan is made for eCommerce websites that use Woocommerce. The package provides essential features that ensure optimal performance for such websites. All the plans from Bluehost do come with a 1-click install of WordPress. Yes, it’s that easy to get WordPress up and running with Bluehost. On top of that, you get an easy to use Cpanel. Think of a Cpanel like your website’s headquarters. You can do things like create emails for your site and create databases as well among many other things. Also, all plans come with a free SSL certificate. Bluehost plans offered right now are already on discount but we got you even greater discount deal. Now that we covered all the plans that Bluehost has to offer, let’s delve deeper into the shared hosting plan. It’s this plan that you will use when starting your website. We always advise beginners to start with a shared hosting plan with Bluehost and scale up as their website grows. Let’s have a look at what the plan has to offer. There are 3 plans within the shared hosting; Basic, Plus and Prime. Basic Plan: This is the plan normally advertised by Bluehost. It costs $3.95 per month when you first sign up. The plan gives you 1 domain and 25 sub-domains. You also get 50 GB of storage for your site and 100MB storage for each of your 5 email accounts. This might seem little, but it’s quite a lot for a website that’s just starting out with no traffic. This plan is practical as many people don’t have more than one website. Plus Plan: With a starting price of $5.95, you get unlimited websites, web space, bandwidth, subdomains, email accounts, and email account storage space. We consider this the best value for money as it has plenty to offer at a low price. Prime Plan: This is another version of the plus plan. It even has the same discounted price as the plus plan at $5.95. You get everything the plus plan has to offer, but with some extra premium features like domain privacy and site backup pro. Pro Plan: This is the final shared hosting plan that Bluehost offers. It’s shared hosting with a twist. It goes for $13.95 per month and offers a dedicated IP, SSL certificates and other perks like domain privacy and site backup pro. With this plan, your website gets more server resources than that offered in the lowered plans. It’s a plan set up for website owners that don’t want to upgrade to other more expensive hosting plans but want more resources than those offered with the normal shared hosting plans. The Pro hosting plan will allow your site to still sit in a shared hosting environment even when it outgrows the entry-level and mid-tier hosting plans. We’d advise you to stick either to the Basic or Plus plan. It has all you need and can meet the needs of your growing website. If you’re more of an expert and need your site to hit the ground running, then you could go for the bigger Prime and pro hosting packages. Remember SSL certificates are now offered free with every plan. If you still on the fence about which Bluehost plan to choose for your needs, Take a look at our guide on which Bluehost plan to choose. Bluehost has a very good knowledge base. You can have your general queries solved in this area. The knowledge base contains articles and step by step tutorials that explain how different aspects of the hosting works. It’s a good place to start when you sign up with the hosting company. If that’s not enough, Bluehost has a Youtube channel that offers video explanations. It caters to people who respond better to videos than plain text. The Youtube channel is active and a great place to visit if the knowledge base on the site isn’t working for you. You have to give Bluehost credit here as they are serious about the security of their hosting environment. This can be seen by their desire to offer security features even to the low-tier hosting plans. They have tools for combating spam like spam assassin and spam experts. You can also get hotlinking protection to prevent people from draining your bandwidth by using your hosted images. Two Factor Authentication and Account token validation are two security features that keep your account safe. The first one ensures no one gets into your account without having access to your phone. The second one helps support staff validate that you’re the owner of the account before any confidential information is submitted. Bluehost offers a Cpanel that’s straightforward and easy to use. In addition, you get to enjoy the app integrations and auto installers that the hosting company has to offer. You can install different open source software like WordPress and Joomla with just a few clicks. This way you get to set up your website quicker. On top of that, there are app integrations like Google apps integration to allow you to hook up your site to G Suite account easily. You can also set up and connect CDNs like Cloudflare to your site thanks to these integrations that Bluehost offers. There are some extra features and benefits you get from Bluehost. You get a free domain for one year along with your hosting plan. On top of that, you also get a free SSL certificate with every hosting plan. An SSL certificate is important for rankings as Google has clearly stated that it will prioritize sites with SSL certificates over those without. You also get automated daily backups of your websites which is impressive. Bluehost does have its downsides as a hosting company. We won’t be providing an unbiased review without having a look at some of these downsides. The prices you get when you sign up for their plans are normally heavily discounted prices. They are meant to lure you in to enjoy the service. Once the original plan you buy expires, you’re expected to renew at the default, non-discounted price. This wouldn’t be a problem except the price difference is huge. For instance, the basic hosting plan starts at $3.95 per month while renewing costs $7.99 per month. This is a huge difference in pricing, but let’s just say this is a common thing that many hosting companies do. And Bluehost is not as bad as some others. Tip: Buy 2-3 years subscription and you can enjoy a discounted price until the subscription expires and you don’t have to renew at regular rates after a year! You need to be careful and wary about this. If you don’t watch out, you might end up paying for a ton of services you don’t necessarily need. When signing up for a Bluehost account for the first time, you’ll notice a ton of add-ons with your purchase. You need to disable them or else you’ll be paying a lot monthly. Upselling is normal and is done by almost every hosting company, but at times it feels like Bluehost overdoes it. Maybe it’s the fact that the first offer is heavily discounted. Some hosting companies do site transfers to their plans for free. It makes sense as it’s a new business that will pay off in the long run. But not Bluehost, they charge $149.99 per site to transfer a website. Other hosts like SiteGround offers site migration completely free. They have placed a limit of up to 5 websites to be transferred, no more than that. Which is strange! If you’d like to switch to Bluehost and are already hosting your website elsewhere, be ready for the hefty fee or learn how to migrate websites yourself. Bluehost is industry leading host, so it’s obvious that it’ll have many competitors. Hosting providers like HostGator, SiteGround, InMotion Hosting, A2 Hosting compete directly with Bluehost. But because of the quality and affordability of Bluehost, it does better against them. Take a look at more Bluehost Comparisons: Namecheap Vs Bluehost, Bluehost Vs Godaddy, Bluehost Vs WPX Hosting and Bluehost Vs HostMonster for a more thorough overview and comparisons. It’s a good question to ask and is a fitting question to answer at the end of such a comprehensive review. I never do reviews of products I don’t know everything about. So I have done this Bluehost review because I have a very good experience and knowledge on Bluehost and this is the most perfect review of Bluehost you’ll find online. The truth is, the answer lies with you and what you think about the company. Have we been able to convince you that Bluehost is a good choice for your site? When starting out, if you choose a wrong hosting provider, it might cost you your business. So you need a reliable hosting option. If you ask us, we’d tell you that Bluehost is a great choice for those just starting to build websites. You get to have a hosting company that is reliable, offers great tools and is aggressively priced. With Bluehost, you can get to run your website without having to worry about behind the scenes of hosting your site. 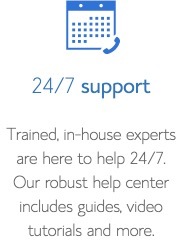 If you run into any issues, the support staff and knowledge base are always available to help. It’s a great choice if you’re starting out, so don’t wait. Get your website up and running with Bluehost today! Thanks for the review on Bluehost and you have provided detailed information. I always love the products review because it saves our time, energy, money & efforts. Thanks for the guidance. This review is going to help many people to make their decision on purchasing this product. Keep up the great work and wishing you great success. All the very best! Thanks, Paul. Your words are much appreciated.